While not perfect, the Mavic Air is easily one of the most impressive drones to date. It's portable, powerful and packed with features. What's more, its batteries last far longer than the smaller Spark. After releasing the Mavic Pro - a drone for consumers wanting something easy to carry around, with a boatload of features to boot - it was hard to see where DJI would go next. The answer is the even smaller and seemingly just as capable Mavic Air. Upon the Air's announcement there was some debate as to where this new drone slotted into the company's line-up. Is it a more powerful Spark or a less powerful Mavic Pro? The answer lies, as you'd expect, somewhere in-between the two (spoiler: it's a little closer to the latter). DJI Mavic Air vs DJI Spark: Which is best? Spark Pro or Mavic Lite? With its semi hard case unzipped and opened, you get a real sense as to the compact nature of this drone. In its case, it takes up about the same amount of space as a pair of Bose headphones might. Folded, the drone comfortably fits in one hand. When folded, the Air is technically smaller than the Spark. The latter has rigid arms which can't collapse, however, making the Air's foldable nature one of its key attractions. The arms fold in very neatly and precisely, by simply pulling them towards or away from the body, while the rear arms swing up and around. For capturing video there's a main camera, which is mounted to the front on a 3-axis gimbal system. When the camera is stowed, it's protected by a removable plastic cover that holds it securely in place, ensuring it can't move too much. In addition to the obstacle avoidance sensors on the front and back, there's the usual selection of lights which light up yellow, red or green depending on a variety of factors - like whether the drone is connected to the remote, or if it's ready to fly. 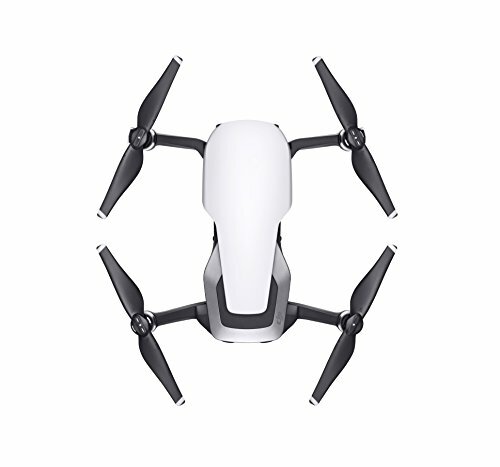 The top of the aircraft has an attractive angular aesthetic, which immediately makes it more premium-looking that the rather plain finish of the Spark, and somewhat more modern than the Mavic Pro. So much attention to detail has gone into making the Air a space-efficient drone. From the folding wings, to the camera mount and battery, it's beautifully compact and easy to carry around. As ever with DJI, there are a few different ways to control the Mavic Air, the best way being with the included remote control. Like the drone itself, it's designed to be foldable and compact, without skimping on the experience. The controller's antennae fold in, as do the smartphone-holding arms fold at the bottom and also hide the remote's joysticks. Again, this is a big attraction. Without the joysticks permanently sticking out, it's easier to slip the remote into a pocket. Like previous remotes, the addition of a smartphone takes care of the live video stream (for iPhone or Android). Of course, you need to download the DJI Go app from the App Store or Play Store, which is free and easy. With the app loaded and drone/controller fired up and connected, you can use simple on-screen icons for take-off. Selecting the option to record a precise home location means the drone will accurately come back to within a few inches from where it took off when you eventually set it to return home. Those familiar with drone-flying will be familiar with the Air controller's joystick layout: the left stick is used for increased/decreasing altitude, and for rotating/changing angle; the right is your joystick for moving forwards, backwards, left and right. Like the Mavic Pro, you can control the Air using just your phone (via Wi-Fi direct), minus the included controller. However, you won't get the long range or responsiveness of the remote control, so it's not of great use. Similarly, you can control it using hand gestures - but these aren't as reliable or responsive as the physical remote. One thing that's long been impressive about DJI's flying devices is their arsenal of high-tech features. Whether it's the obstacle-avoidance system, return-to-home feature or the array of pre-programmed flying and capture modes, there's so much to sink your teeth into. That list even grew slightly with the Mavic Air. One of the most praise-worthy new additions is the advanced obstacle-avoidance system. Rather than the drone just stopping when it detects an obstacle in front of it, it manoeuvres around it while continuing on the same path. We tested it a few times, flying low to the ground near rocks and long reeds, and it's really interesting watching the Air make small movements in its flight. Quick Shot is undoubtedly one of the big reasons to buy the Mavic Air, too. With just a few taps on the connected smartphone screen you can have a pre-programmed cinematic shot focusing on one person within the frame. There are a variety of modes, too: Dronie, Boomerang and Asteroid. Dronie keeps locked-on the subject as it flies backwards and upwards. Boomerang does what you think it might: starts in one position, locked onto the subjects, then goes up and around them, slowing down at the top of the arch, then coming back around again, performing a swooping 360-degree orbit. The only time it got a little shaky was when tested during some high winds. Asteroid is equally awe-inspiring, but requires some patience. In this mode, the drone flies upwards and back, going much higher than in Dronie mode, to shoot birds-eye view footage, and transform it into a miniature planet-like view. Once the drone gets to its highest point, it does take some time to capture a full panorama shot, but the end result is worth the wait. ActiveTrack, which allows you to draw a square around the subject on the screen to maintain focus, sounds great - but was one of the more unreliable features in our testing. Sadly, regardless of the lighting conditions, or how near or far the drone was from the subject, ActiveTrack seemed to lose what it was tracking within a few seconds. Whether we chose the Trace or Profile - which tell the drone to follow behind or alongside the subject - the drone just stayed in a virtually stationary position most times. It was disappointing to say the least. One other small issue we had was with the camera gimbal. Every now and then it would tell us the gimbal motor was overloaded, and we weren't able to control the camera's angle/direction. It meant either landing, switching it off and on again, or choosing a different shooting mode to see if that would refresh it somewhat. The wind we tested the Air in was strong enough that it set off the red alert, telling us the wind was too strong. It was hat-almost-blown-off-our-head strong. It wasn't a consistent wind either, we tested it on a coastline, on high ground near a cove, where the direction and strength changed regularly. Even so, the Air handled these blustery conditions really well. Due to how small it is, however, it does have to work hard to stay relatively stable - it doesn't handle the wind as easily as some of the bigger drones, like the Phantom 4 Pro. While using Quick Shot modes in these gusts, the results were shaky, too. Filming manually, just controlling with the joysticks was a little smoother, given that we were able to steady it ourselves somewhat, keeping the movements slow and steady, while the drone fought against the wind. Cameras in DJI drones are capable, but aren't always perfect. The Mavic Air is no different. You don't get the same quality video or stills as you'd get from the impressive 1-inch Phantom 4 Pro sensor, but you do get attractive results nonetheless. There are some shortcomings, however, when shooting in the automatic mode. The camera is often slow to adapt exposure to changing lighting conditions, like when the sun came out from behind a cloud, or when gradually moving from pointing towards the sky and onto the ground. There's also purple flare from direct light sources. Tapping on the controller-based smartphone screen should provide automatic focus and exposure adjustment, but often it was unresponsive, resulting in footage that was either over- or under-exposed. When the camera did get it right, the footage could look over-saturated, making colours seem almost hyper-real, like a cartoon. Blue skies were far too blue, green grass far too vivid. However, this kind of result wasn't constant - but it did happen once or twice. Which all sounds rather critical. But it's more about balancing expectation, as the Air doesn't dangle a pro-spec DSLR from its small and light body. Apart from these odd occasions, as outlined, the stills and video generally looks good when viewed back on a separate display. Add the right kind of smooth, controlled movements, and it's possible to capture some pro-looking aerial shots. Plus the Air has a plethora of new shooting options - like 32MP 180-degree panoramas, and 120fps slow-motion video (among others) - making it one of the most versatile quadcopter cameras around. Normally when a DJI gives a battery estimate, and says its drone can last a given amount of time before the battery is empty, you can normally shave 10-20 per cent off that quote. In our testing - which was never in completely still conditions - we managed around 18-19 minutes of flying time before the battery was completely drained, keeping that prediction true. That's still good, though, especially in windy conditions. And if you want more then buy a combo with two extra batteries for enough juice to fly for almost an hour. The Mavic Air is easily one of the most impressive drones to date. It's small, powerful, feature-rich and portable. What's more, its batteries last far longer than the smaller Spark, offering around 20 minutes of flying time in not-too-blustery conditions. It's not quite perfect, though. The camera quality isn't as pro-grade as, say, the Phantom 4 Pro. And in our Air sample the ActiveTrack tracking didn't work well at all, which was a shame. So, back to the original question: Air, Spark or Pro? Well, the Air is so much more powerful than the Spark, yet considerably more affordable and portable than the Pro. In essence, then, it's approaching "Pro mini" territory. Which is a very good thing indeed.